Since it's Valentine's day I thought I'd post some earrings I designed ages ago. They're quick to do and make an easy little gift. Experienced tatters will find the diagram above sufficient to tat these earrings, but for newer tatters here are some more specific instructions. In size 20 thread you will need about a yard of thread for each earring. You need 2 shuttles. Load 21 beads and the earring hook* onto the thread. Wind each shuttle leaving all the beads in the middle between them. Divide off six beads to be used in the rings and leave all the others for the chains and the outward ring at the bottom. Begin the first ring with all 6 beads in the ring. You could use only 5 beads, but the earring hook will sit better lying between 2 beads than it does on top of 1. Tat 6 stitches and slide all 6 beads and the hook into the picot. Leave a little extra thread in the picot for all the joins, tat the last 6 stitches and close. RW. 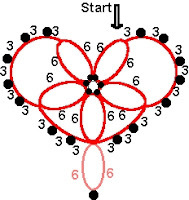 Tat the chain sliding a bead into each picot as shown on the diagram. RW. When you tat the next ring join into the beady picot leaving one bead between the first and second ring. Finish the ring. RW. Tat the next chain sliding beads into place. RW. Tat the next ring joining into the beady picot, just like the last ring leaving one bead between rings. RW. With the second shuttle, slide one bead into the ring and tat the outward ring at the bottom of the heart sliding the bead into place on the picot. Finish the ring and switch shuttles to tat the chain. Continue around the heart leaving 2 beads and the hook in the join between the first and fifth rings. * Some earring hooks have a closed hole at the end and it's necessary to start with the hook in place before you begin. Some have a little gap that you can slide the thread under after the earring is completed. With a closed hole you have the hook in the way as you tat, but the hook isn't going to fall off when the earring is finished. With an open gap, to slide the thread under, it's easier to tat the earring and add the hook later, but the thread that can slide under the gap can also slide out and the hook can fall off the earring. I love how you do tatting. So cool ! I want to tat this but I need some written instructions. Do you have some? Do you have written instructions for this? Tatting that didn't make it.